The 2018 NFL Draft class features some impressive talent at the defensive tackle position. In my preliminary viewings I’ve come across four defensive tackles I believe could be legitimate first round picks. Of that group, one tackle from the Big 10 stands above the rest. That tackle is Michigan defensive lineman Maurice Hurst. Hurst is listed at 6’2″ 282 pounds, clearly projecting as a 3-technique at the professional level. He spent most of his time in college playing that under-tackle position, but he did move down over the center from time to time. Considering his current weight and play style, however, I wouldn’t be drafting him to play nose or 1-technique. Maurice Hurst was a consensus All American at Michigan, and was arguably the most disruptive interior lineman in the entire draft class. Hurst plays with a nonstop motor, possesses impressive play strength, and is incredibly explosive off the line of scrimmage. Here’s an example of that explosive first step. Hurst is lined up as the 3-technique on the far side. Winning with his first step quickness and burst, Hurst gives the offensive linemen absolutely no chance to block him. He then powers through the recovery attempt by the lineman to make the tackle in the backfield. As you can see on this play, Hurst’s pad level is another one of his strengths. Rarely does he play higher than the opposing offensive lineman, helping him to win with leverage often. On this snap, Hurst once again beats the offensive lineman with his first step. This time the backside guard is looking to cut Hurst off from the play, but due to Hurst’s alignment and burst the guard has no chance. Hurst keeps his pad level low, doesn’t get too deep into the backfield, and makes a play on the running back. Maurice Hurst is also a very intelligent defensive lineman. He showed the ability to sniff out screens and often reads and reacts to the run effectively and efficiently. His explosiveness, strength, leverage, and quick hands are what separates him from the rest of this draft class as a run defender. As a pass rusher, Maurice Hurst is effective as well. His best rush move is his quick swim, where he can use his quick and heavy hands to quickly go past blockers. Here’s an example of Hurst’s quick swim move. Lined up as a three technique on the far side, Hurst beats the guard with his swim move, gets to the quarterback, and forces the incompletion. The guard lunged at Hurst and put his head down, making life very easy on Hurst on this rep.
Hurst’s list of weaknesses is rather short. He doesn’t have “prototypical size” for a defensive tackle. Most of the time this doesn’t bother me as he uses his size deficiencies to his advantage with his explosive play style. He does struggle against double teams, however, getting knocked off the ball a little too much. Hurst also can get out of control at times. While the clips above show him getting his belt buckle two yards into the backfield, reading, and reacting, he sometimes does lose track of where he is. This results in him fighting pressure the wrong way or getting lost in the sea of blockers. I’d also like to see Maurice Hurst shed blockers against the run more often. He sometimes relies on his power and leverage to bull through linemen too much and this might not work as well in the NFL. This is tough to criticize, though, because my favorite part of his game is his explosiveness and ability to win with leverage. 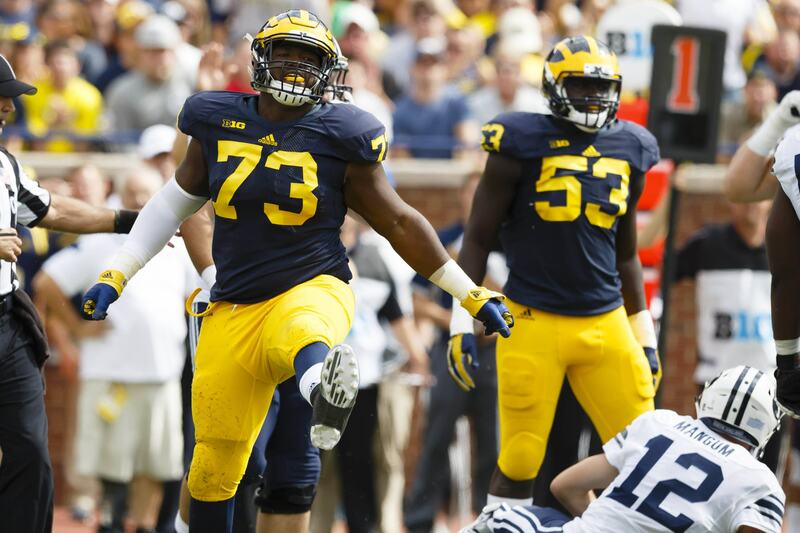 Maurice Hurst is an explosive, powerful, smart, and disruptive defensive tackle. He lived in opponents’ backfields in college and should do more of the same at the professional level. Maurice Hurst earns a first round grade on my 2018 NFL Draft board.